Published: Jan. 14, 2015 at 01:41 p.m. Updated: Jan. 14, 2015 at 05:27 p.m. The 2014 rookie class included some good players and solid depth, but it really stood out for one reason: the receivers. Odell Beckham Jr. and Mike Evans headlined a stellar crop of young pass-catchers that ranks among the best I can remember. So when I put together this year's All-Rookie Team, I decided to expand the roster on offense to include three receivers, as you'll see below. Bridgewater's completion percentage (64.4) is the third-highest in NFL history for a rookie starting at least 10 games, which really says something. I think offensive coordinator Norv Turner helped Bridgewater significantly; you could see him making progress from week to week. 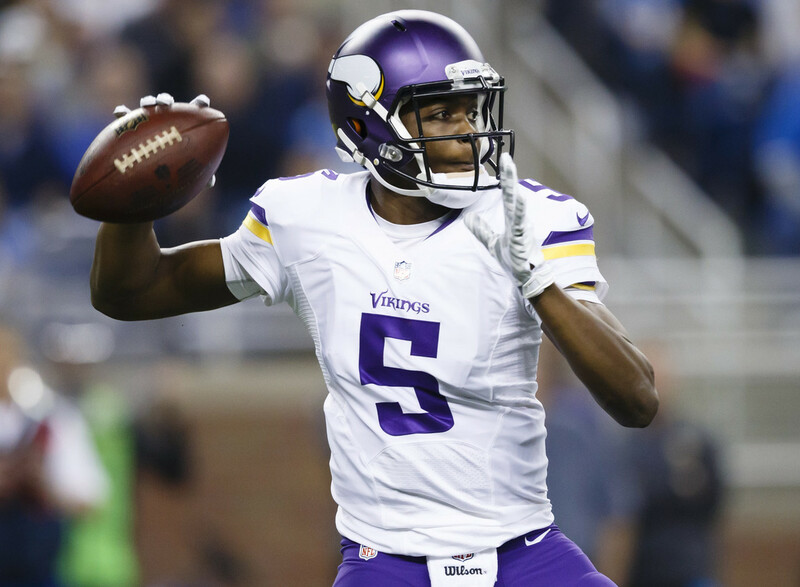 Bridgewater has a live arm, knows where to throw the ball and is smart. His accuracy and athletic ability are reminiscent of Alex Smith. While most people probably expected Hill to be a good player, he turned out to be truly special, absolutely one of the better running backs to enter the NFL in the past five years. He split time with second-year pro Giovani Bernard in the first portion of the season -- and still racked up 1,124 yards and nine scores. He also ran for more than 140 yards in four separate games, tied with Curtis Martin for the second-most by a rookie in NFL history. Hill is the real deal; he runs with power, makes guys miss and can catch the ball, meaning he can stay in for all three downs. He should be a perennial Pro Bowl mainstay. Mason recovered from a slow start -- he was inactive for the Rams' first four games of the season -- to put up respectable numbers (765 rushing yards and four scores on 179 carries), including a Week 13 performance against the Raiders in which he posted an 89-yard scoring run and a 35-yard touchdown catch. I think he impressed people with a) his pass-catching abilities and b) how good he was in pass protection, especially with picking up the blitz. I don't know if he's a future Pro Bowl regular, but he has a lot of quickness and should be a strong starter. Beckham played in just 12 games -- and still had an epic rookie season. He had the most receiving yards per game (108.8) of any rookie receiver in NFL history, as well as the second-most receptions (91), the fourth-most yards (1,305) and the fourth-most touchdown catches (12). He's a matchup nightmare who can play in the slot or outside; he's one of those guys who can stop on a dime and leave you nine cents change. He has everything, including -- as he showed with that grab for the ages against the Cowboys -- great receiving ability. Beckham might have been as good a rookie receiver as I've ever seen. Evans -- who became the youngest player in NFL history to post a 200-yard game with his 209-yard effort against the Redskins in Week 11 -- is a huge target (6-foot-5, 231 pounds) with plenty of speed and athletic ability. He's very difficult to defend against, and seemed to improve every week. It's tough to be a receiver in Buffalo; with the wind they have up there, you really need a quarterback who can get the ball to you if you want to succeed. Even so, Watkins fulfilled all the promise people saw in him as a prospect. He's fast and tall, which makes it tough to engage him and keep him from getting off the line in press coverage. Watkins should be a top receiver for years to come. The rookie crop of tight ends didn't end up having a great year, with highly touted prospects Eric Ebron and Austin Seferian-Jenkins dealing with injuries and failing to put up much in the way of numbers. Though he needs to improve his blocking skills, Amaro has good hands and catches the ball well. The Dolphins were criticized for drafting James in the first round, but he ended up starting all 16 games and really contributing, especially when he capably replaced Pro Bowl left tackle Branden Albert, who was lost for the year with a knee injury in November. James was very good in pass protection for a rookie, far exceeding expectations for what he could do as a first-year pro at left tackle. Matthews was thrown into the left tackle position due to an injury to Sam Baker and, like James, performed well for a rookie. Matthews projects as someone who can play at any spot on the line -- tackle, guard or center -- and do it well. If family history means anything, the latest Matthews scion should be a mainstay as a starter for the next decade and a half. Martin simply dominated his opponents, serving as a key cog on a powerhouse offensive line and becoming the only rookie to receive All-Pro honors. It is very rare that a lineman will come in and play as well as Martin did in his first year. And he played hurt, to boot, which makes his season all the more impressive. Bitonio started all 16 games on a line that helped the Browns rush for 345 more yards than they did in 2013 and win three more games. He's a solid guard who pulls well and is good at pass protection, playing at a surprisingly high level for a second-round selection. Stork took over the starting spot at center for the Patriots' blowout loss to the Chiefs in Week 4, and shortly thereafter, the line gelled and the offense picked up. He did very well with both run blocking and pass protection, and was one of three centers (Green Bay's Corey Linsley and Cincinnati's Russell Bodine are the others) who had remarkable success as rookies; Stork just barely beat out Linsley for this spot. The Patriots will miss Stork if a knee injury keeps him out of the AFC title game this Sunday. Whether he's rushing the passer or making plays against the run, the Pro Bowler is a real force, someone who combines tremendous quickness, explosion and strength into one dominant package. That he racked up nine sacks from the tackle position stands out; he'll be a factor in the NFL for a long time. Jernigan filled in nicely during Haloti Ngata's four-game suspension to end the regular season, finishing the year with 23 tackles and four sacks and chipping in another sack in the Ravens' playoff loss to the Patriots after missing the wild-card round with foot and ankle injuries. Jernigan is strong and moves around well, possessing good pass-rush ability for an inside defender. His quickness makes him tough to block. Ellis didn't have any sacks, but that's OK, because his primary duty was to be a run-stopper -- and he did that extremely well. He uses his strong upper body to great effect. Barr missed the last four weeks with a knee injury, but he was all over the field for the first three-quarters of the season, racking up 70 tackles, four sacks and two forced fumbles -- including one that he returned for a memorable game-winning touchdown against the Buccaneers in Week 8. He looked good dropping into space and rushing the passer. As a tall, athletic guy who runs fast, he's tough for opposing offensive lines to match up against. Opponents quickly realized Mack has to be accounted for on every play, even those that don't go in his direction. Mack really came on toward the end of the year, notching three of his four sacks in the last four games. He's a rising talent who will be a star in the NFL. Mosley exceeded even the high expectations that come with being a first-round pick, posting 133 tackles, three sacks, two picks and a forced fumble, and proceeding to earn Pro Bowl honors. He can make a tackle on the line or play in space; he just seems to have a sense of where every play is going. Borland is undersized (5-11, 248 pounds) but highly competitive. He had 107 tackles, one sack and two picks in 14 games, showing a unique ability to diagnose what the offense is doing; it was almost like he was in the other huddle and knew what was going to happen in advance. Borland missed the final two games of the season with an ankle injury, but he's proven himself to be a defensive talent. Fuller started the season extremely well, posting three picks in his first three games, before injuries got in the way and slowed him down. He's a good cover corner who can come up and make tackles; he seems to have a good sense of where the ball is. Fuller has a bright future. Fourteen passes defensed is an excellent total for a rookie; that figure shows Breeland has pretty good skills. He also shined when matched up against Dez Bryant in Dallas back in Week 8, helping to hold the dynamic receiver to three catches for 30 yards. Breeland is a very fluid athlete who plays with a sense of urgency and is aggressive supporting the run. He's played a key role for the Packers' defense this year, proving to be equally good making plays at the line and in space. He's speedy enough to handle the slot receiver, can process information very quickly and has great tackling ability. Bucannon is an in-the-box type of safety who makes a lot of tackles (81) and is very aggressive. He's more of a run-stopper than he is a space player, but in the type of defense the Cardinals played in 2014, that was fine. Bucannon might not be a perennial Pro Bowler, but he'll start and play well for a number of years. He hit 29 of 33 field-goal attempts (87.9 percent), which is outstanding for a first-year pro. The strong-legged Catanzaro hit his first 17 field-goal attempts, tying an NFL record for consecutive field goals made to start a career. O'Donnell had some pretty impressive stats, averaging 43.8 yards per punt and having 20 punts downed inside the 20-yard line. His success is especially notable because he plays his home games in Soldier Field, which is a pretty tough place to kick in. Thomas saw the field in special offensive situations, but he stood out as a return man, averaging 30.6 yards per kickoff return and 11.9 per punt return, running one punt back for an 81-yard touchdown. He has great hands and is very fast, helped by an outstanding second gear.